Particle accelerators (also known as atom-smashers) are devices used for increasing the velocity of subatomic particles such as protons, electrons, and positrons. Although they were originally invented for the purpose of studying the basic structure of matter, particle accelerators later found a number of practical applications. There are two large subgroups of particle accelerators: linear and circular accelerators. Machines of the first type accelerate particles as they travel in a straight line, sometimes over very great distances. Circular accelerators move particles along a circular or spiral path in machines that vary in size from less than a few feet to many miles in diameter. One of the earliest particle accelerators developed was invented by Alabama-born physicist Robert Jemison Van de Graaff (1901–1967) in about 1929. The machine that now bears his name illustrates the fundamental principles on which all particle accelerators are based. Cyclotron: A particle accelerator in which subatomic particles are accelerated to high speeds in a circular path. Dee: An electrically charged metallic container that makes up half of a cyclotron. Particles pass from one dee to another as they travel back and forth through the machine. Drift tube: A cylindrical tube in a linear accelerator through which particles are accelerated. Electron: A fundamental particle of matter carrying a single unit of negative electrical charge. Electron volt (eV): A unit used to measure the energy of subatomic particles in a particle accelerator. Linear accelerator: A particle accelerator in which subatomic particles are accelerated to high speeds in a straight line. Proton: A fundamental particle of matter carrying a single unit of positive electrical charge. Superconducting Supercollider: A particle accelerator designed to be the most powerful machine of its kind in the world. Synchrotron radiation: A form of radiation (energy in the form of waves or particles) somewhat similar to X rays given off by certain kinds of particle accelerators. The Van de Graaff accelerator consists of a tall metal cylinder with a hollow metal dome at its top. A silk conveyor belt runs through the middle of the cylinder. At the bottom of the cylinder, the belt collects positive charges from a high-voltage source. The positive charges ride to the top of the cylinder on the belt and are deposited on the outside of the dome at the top of the machine. The longer the belt runs, the more positive charges accumulate on the dome. The original Van de Graaff accelerator could produce an accumulation of charge with an energy of 80,000 volts, although later improvements raised that value to 5,000,000 volts. At some point, the accumulation of charges on the hollow dome becomes so great that a bolt of lightning jumps from the dome to a metal rod near the machine. The bolt of lightning consists of positive charges that accumulate on the dome and are finally repelled from it. The Van de Graaff accelerator can be converted to a particle accelerator simply by attaching some kind of target to the metal rod near the machine. When the bolt of lightning strikes the metal rod, it will bombard the target. Atoms of which the target is made will be broken apart by the beam of positively charged electricity. In a Van de Graaff generator, the bolt of lightning that travels from the dome to the target consists of charged particles whose velocity has increased from zero (while at rest on the dome) to more than 100,000 miles per second (160,000 kilometers per second) in the gap between dome and target. Linear accelerators (also known as linacs) operate on the same general principle, except that a particle is exposed to a series of electrical fields, each of which increases the velocity of the particle. A typical linac consists of a few hundred or a few thousand cylindrical metal tubes arranged one in front of another. The tubes are electrically charged so that each carries a charge opposite that of the tube on either side of it. Tubes 1, 3, 5, 7, 9, etc., might, for example, be charged positively, and tubes 2, 4, 6, 7, 10, etc., charged negatively. Imagine that a negatively charged electron is introduced into a linac just in front of the first tube. In the circumstances described above, the electron is attracted by and accelerated toward the first tube. The electron passes toward and then into that tube. Once inside the tube, the electron no longer feels any force of attraction or repulsion and merely drifts through the tube until it reaches the opposite end. It is because of this behavior that the cylindrical tubes in a linac are generally referred to as drift tubes. At the moment that the electron leaves the first drift tube, the charge on all drift tubes is reversed. Tubes 1, 3, 5, 7, 9, etc. are now negatively charged, and tubes 2, 4, 6, 8, 10, etc. are positively charged. The electron exiting the first tube now finds itself repelled by the tube it has just left and attracted to the second tube. These forces of attraction and repulsion provide a kind of "kick" that accelerates the electron in a forward direction. It passes through the space between tubes 1 and 2 and into tube 2. Once again, the electron drifts through this tube until it exits at the opposite end. As the electron moves through the linac, the electric charge on all drift tubes reverses in a regular pattern. As it passes through the tube, the electron is repelled by the tube behind it and attracted to the tube ahead of it. The added energy it receives is exhibited in a greater velocity. As a result, the electron is moving faster in each new tube it enters and can cover a greater distance in the same amount of time. To make sure that the electron exits a tube at just the right moment, the tubes must be of different lengths. Each one is slightly longer than the one before it. The largest linac in the world is the Stanford Linear Accelerator, located at the Stanford Linear Accelerator Center (SLAC) in Stanford, California. An underground tunnel 3 kilometers (2 miles) in length passes beneath U.S. Highway 101 and holds 82,650 drift tubes along with the magnetic, electrical, and auxiliary equipment needed for the machine's operation. Electrons accelerated in the SLAC linac leave the end of the machine traveling at nearly the speed of light with a maximum energy of about 32 GeV (gigaelectron volts). The term electron volt (eV) is the standard unit of energy measurement in accelerators. It is defined as the energy lost or gained by an electron as it passes through a potential difference of one volt. Most accelerators operate in the megaelectron volt (million electron volt; MeV), gigaelectron volt (billion electron volt; GeV), or teraelectron volt (trillion electron volt; TeV) range. The development of linear accelerators is limited by some obvious physical constraints. For example, the SLAC linac is so long that engineers had to take into consideration Earth's curvature when they laid out the drift tube sequence. One way of avoiding the problems associated with the construction of a linac is to accelerate particles in a circle. Machines that operate on this principle are known, in general, as circular accelerators. The earliest circular accelerator, the cyclotron, was invented by University of California professor of physics Ernest Orlando Lawrence (1901–1958) in the early 1930s. Lawrence's cyclotron added to the design of the linac one new fundamental principle from physics: a charged particle that passes through a magnetic field travels in a curved path. The shape of the curved path depends on the velocity of the particle and the strength of the magnetic field. 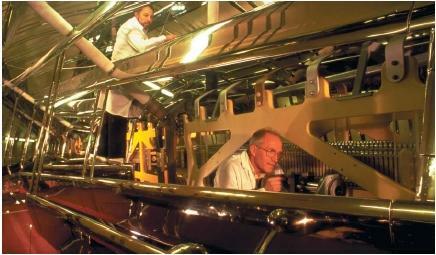 The cyclotron consists of two hollow metal containers that look as if a tuna fish can had been cut in half vertically. Each half resembles an uppercase letter D, so the two parts of the cyclotron are known as dees. At any one time, one dee in the cyclotron is charged positively and the other negatively. The dees are connected to a source of alternating current so that the electric charge on both dees changes back and forth many times per second. The second major component of a cyclotron is a large magnet situated above and below the dees. The presence of the magnet means that any charged particles moving within the dees will travel not in straight paths but in curves. Imagine that an electron (carrying a negative charge) is introduced into the narrow space between the two dees. The electron is accelerated into one of the dees, the one carrying a positive charge. As it moves, however, the electron travels toward the dee in a curved path. After a fraction of a second, the current in the dees changes signs. The electron is then repelled by the dee toward which it first moved, reverses direction, and heads toward the opposite dee with an increased velocity. Again, the electron's return path is curved because of the magnetic field surrounding the dees. Just as a particle in a linac passes through one drift tube after another, always gaining energy, so does a particle in a cyclotron travel back and forth between dees gaining energy. As the particle gains energy, it picks up speed and spirals outward from the center of the machine. Eventually, the particle reaches the outer circumference of the machine, passes out through a window, and strikes a target. 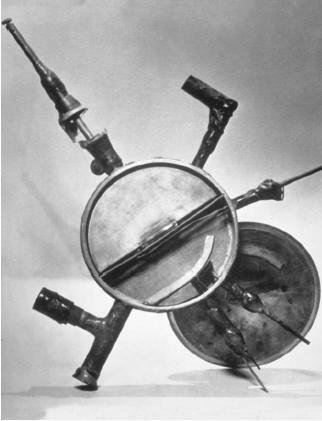 Lawrence's original cyclotron was a modest piece of equipment, only 11 centimeters (4.5 inches) in diameter, capable of accelerating protons to an energy of 80,000 electron volts (80 keV). It was assembled from coffee cans, sealing wax, and leftover laboratory equipment. The largest accelerators of this design ever built were the 218-centimeter (86-inch) and 225-centimeter (87-inch) cyclotrons at the Oak Ridge National Laboratory and the Nobel Institute in Stockholm, Sweden, respectively. At first, improvements in cyclotron design were directed at the construction of larger machines that could accelerate particles to greater velocities. Soon, however, a new problem arose. Physical laws state that nothing can travel faster than the speed of light. Thus, adding more and more energy to a particle will not make that particle's speed increase indefinitely. Instead, as the particle's velocity approaches the speed of light, additional energy supplied to it appears in the form of increased mass. A particle whose mass is constantly increasing, however, begins to travel in a path different from that of a particle with constant mass. There is a practical significance to this fact: as the velocity of particles in a cyclotron begins to approach the speed of light, those particles start to fall "out of synch" with the current change that drives them back and forth between dees. Two different modifications—or a combination of the two—can be made in the basic cyclotron design to deal with this problem. One approach is to gradually change the rate at which the electrical field alternates between the dees. The goal here is to have the sign change occur at the exact moment that particles have reached a certain point within the dees. As the particles speed up and gain weight, the rate at which electrical current alternates between the two dees slows down to "catch up" with the particles. In the 1950s, a number of machines containing this design element were built in various countries. Those machines were known as frequency modulated (FM) cyclotrons, synchrocyclotrons, or, in the former Soviet Union, phasotrons. The maximum particle energy attained with machines of this design ranged from about 100 MeV to about 1 GeV. A second solution for the mass increase problem is to alter the magnetic field of the machine in such a way as to maintain precise control over the particles' paths. This principle has been incorporated into the synchrotrons—machines that are now the most powerful cyclotrons in the world. A synchrotron consists essentially of a hollow circular tube (the ring) through which particles are accelerated. (The particles are actually accelerated to velocities close to the speed of light in smaller machines before they are injected into the main ring.) Once they are within the main ring, particles receive additional jolts of energy from accelerating chambers placed at various locations around the ring. At other locations around the ring, very strong magnets control the path followed by the particles. As particles pick up energy and tend to spiral outward, the magnetic fields are increased, pushing particles back into a circular path. The most powerful synchrotrons now in operation can produce particles with energies of at least 400 GeV. In the 1970s, nuclear physicists proposed the design and construction of the most powerful synchrotron of all, the Superconducting Super Collider (SSC). The SSC was expected to have an accelerating ring 82.9 kilometers (51.5 miles) in circumference with the ability to produce particles having an energy of 20 TeV. Estimated cost of the SSC was originally set at about $4 billion. Shortly after construction of the machine at Waxahachie, Texas, began, however, the U.S. Congress decided to discontinue funding for the project. Accelerators have also found some important applications in medical and industrial settings. As particles travel through an accelerator, they give off a form of radiation known as synchrotron radiation. This form of radiation is somewhat similar to X rays and has been used for similar purposes. More on van de graff accelerators please!!!!! This article is really good and it helped me alot! Great baseline information, I actually am working on a project with a Scientist/Engineer from the Waxahachie site.